Fight or Flight. When the gatorclaw is reduced to 40 hit points or fewer, roll 1d6. 1-4: the gatorclaw attempts to retreat from the combat as fast as it can travel. However, it is a territorial creature and returns after regenerating (do not count this as beating the encounter unless the return of the gatorclaw will not inconvenience the party or prevent the success of their objective). The gatorclaw has advantage on Strength checks and Strength saving throws. Increase the damage dealt by each of its melee attacks by 2. The gatorclaw gains resistance to bludgeoning, piercing, and slashing damage. Hold Breath. The gatorclaw can hold its breath for 15 minutes. Keen Senses. The deathclaw has advantage on Wisdom (Perception) checks. Pounce. If the gatorclaw moves at least 20 feet straight toward a creature and then hits it with a claw attack on the same turn, that target must succeed on a DC 16 Strength saving throw or be knocked Prone. If the target is Prone, the gatorclaw can make a bite attack as a bonus action. Powerful Leap. When the gatorclaw makes a long jump, it can leap up to forty feet if it moves at least 10 feet on foot immediately before the jump. When it makes a standing long jump, it can leap only twenty feet. Each foot cleared on the jump costs a foot of movement. Regeneration. The gatorclaw regains 10 hit points at the start of any turn it begins with more than 0 hit points. Rip and Tear. 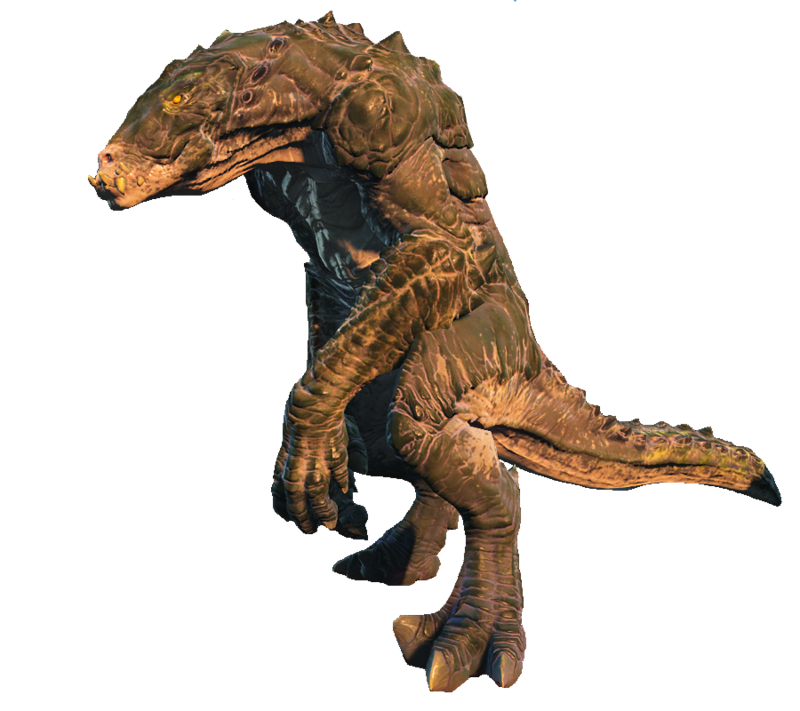 If the gatorclaw has grappled a creature, it can always use its bite attack against that creature as a bonus action, and the attack deals the maximum possible damage (24 piercing damage). Multiattack. The gatorclaw makes four attacks with its claws. If at least two of the the gatorclaw’s claw attacks hit the same target, it can also use its bite against that target. Bite. Melee weapon attack: +9 to hit, reach 5 ft., one target. Hit: 15 (2d10 + 5) piercing damage and the target is grappled (escape DC 16). Until this grapple ends, the target is restrained, and the gatorclaw can’t bite another target. Claw. Melee weapon attack: +9 to hit, reach 5 ft., one target. Hit: 14 (2d8 + 5) slashing damage. Frightful Presence. Each creature of the gatorclaw’s choice that is within 60 feet of the gatorclaw and aware of it must succeed on a DC 16 Wisdom saving throw or become Frightened for 1 minute. A creature can repeat the saving throw at the end of each of its turns, ending the effect on itself on a success. If a creature’s saving throw is successful or the effect ends for it, the creature is immune to the gatorclaw’s Frightful Presence for the next 24 hours.